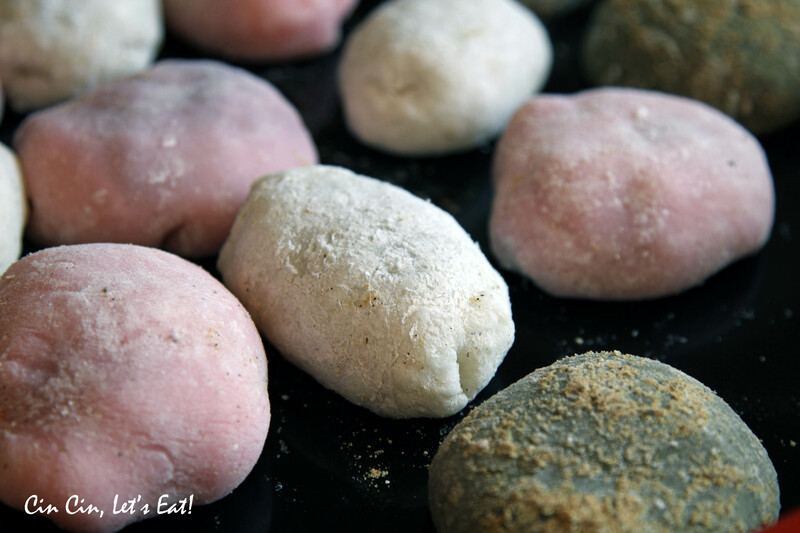 Making Daifuku Mochi [recipe] – Cin Cin, Let's Eat! For our ramen dinner, I thought some daifuku mochi would be fitting with the Japanese theme. They are usually filled with sweetened red or white bean paste, I often have cans of red bean paste (aka “anko”) on hand so I didn’t bother to make my own. The problem with store bought paste is that it’s usually too sweet, and the texture is more wet and not as dense, makes it more difficult to fill the mochis. It’s pretty easy and straight forward to make your own if you can’t find the paste in your grocery store’s ethnic aisle, just boil the beans, and sweeten the paste with sugar. A quick search online for anko recipes and you will find that there are different types of anko, some with skins on, some without. I like anko chunky with skins on, but it really doesn’t affect the taste too much. I used the recipe posted from Globetrotter Diaries. They have beautiful pictures and detailed instructions so I didn’t feel the need to take the step-by-step pictures. Instead of using persimmons, I used strawberries to make “Ichigo Daifuku”, but since I know I don’t have the chops to wrap the whole strawberry inside without breaking the mochi, I chopped them up and mixed with the red bean paste first. Turned out equally delicious! Here is a slightly shortened recipe and directions from Globetrotter Diaries. -For pink color, add 1 drop of red food coloring. 1. Sprinkle cornstarch generously on your counter top. 2. 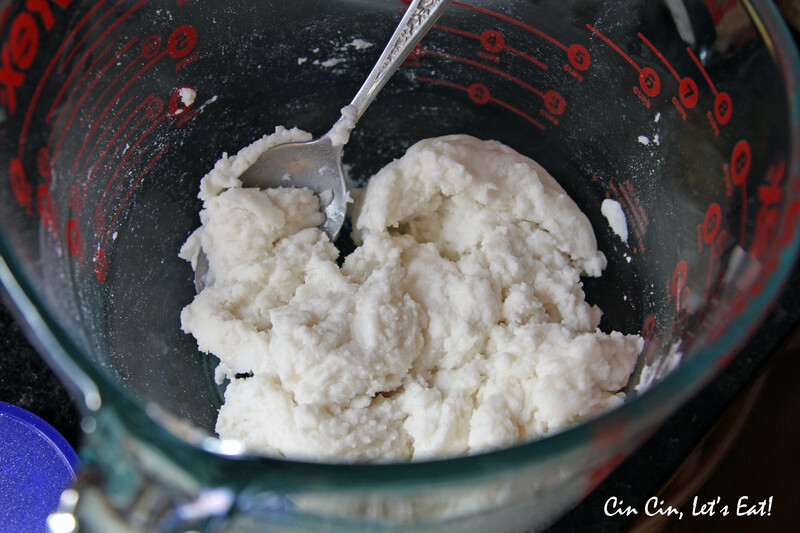 Combine sweet rice flour, sugar, and water in a microwave safe bowl. (add green tea powder or red food coloring here if you are making green or pink ones.) Mix until smooth. If the mixture is too dry, add a little more water. Microwave the mixture on high for 1-2 minutes. Step and check every 30 seconds or so. If it’s starting to set, give it a quick swirl and put it back in the microwave for another 30 seconds. The perfect mochi is smooth, sticky and soft, but not overly wet. 3. Empty the ball of mochi on to the cornstarched surface, it will be HOT so use a spatula if you need to. 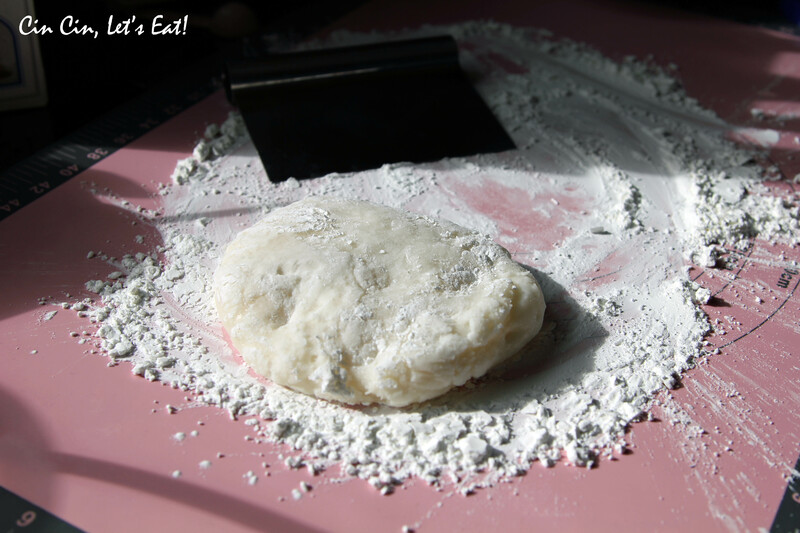 Coat your hands with cornstarch and knead the mochi to work out any lumps. Cut the mochi in half, then each half into thirds to make 6 pieces. 4. Using both palms and the pads of your fingers, flatten the mochi into a circle about 3-4 inches in diameter. Ideally you want the outer edge to be slightly thinner than the center of your flattened disc, as the edges will soon be pinched together to form your ball. Sprinkle a bit of cornstarch onto your hands or into the mochi if things are getting sticky. 5. 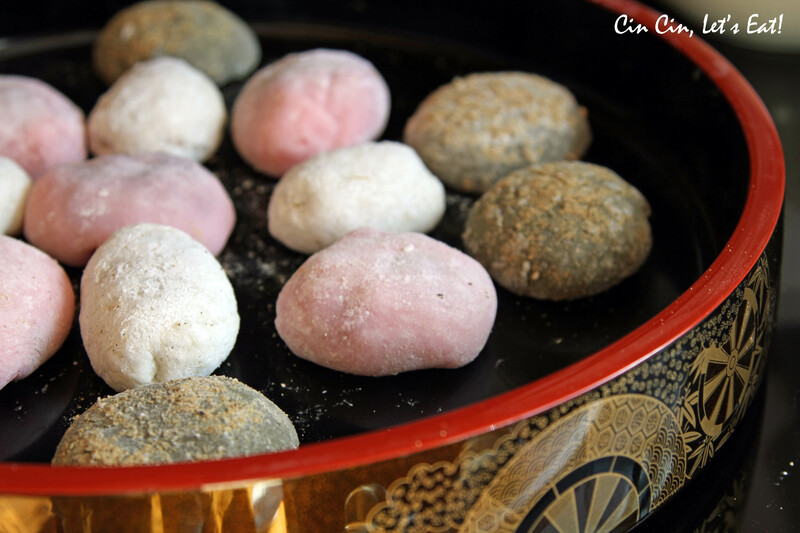 For white and green tea mochis: Place 2 tablespoons of red bean paste into the center of the flattened disc. Then carefully lift the edges of the mochi up over the red bean paste and pinch them together to completely encase it. 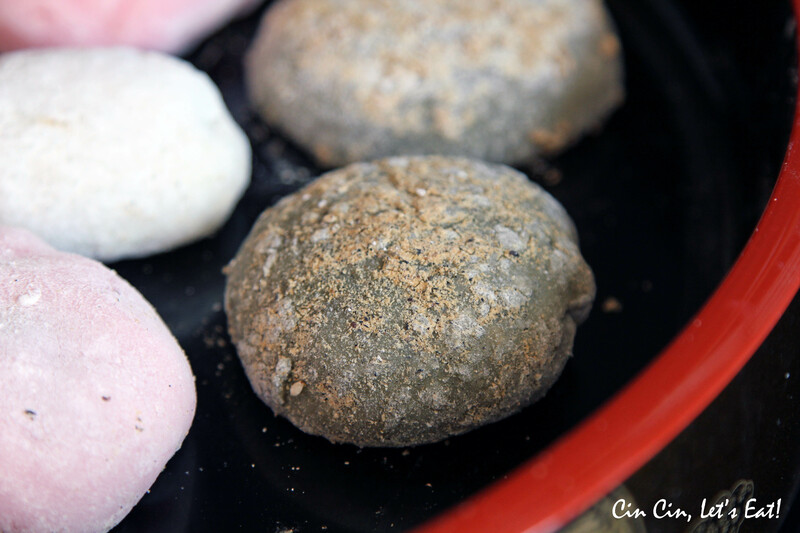 Use both hands to help mold the mochi into a ball if the shape has become irregular in the process. 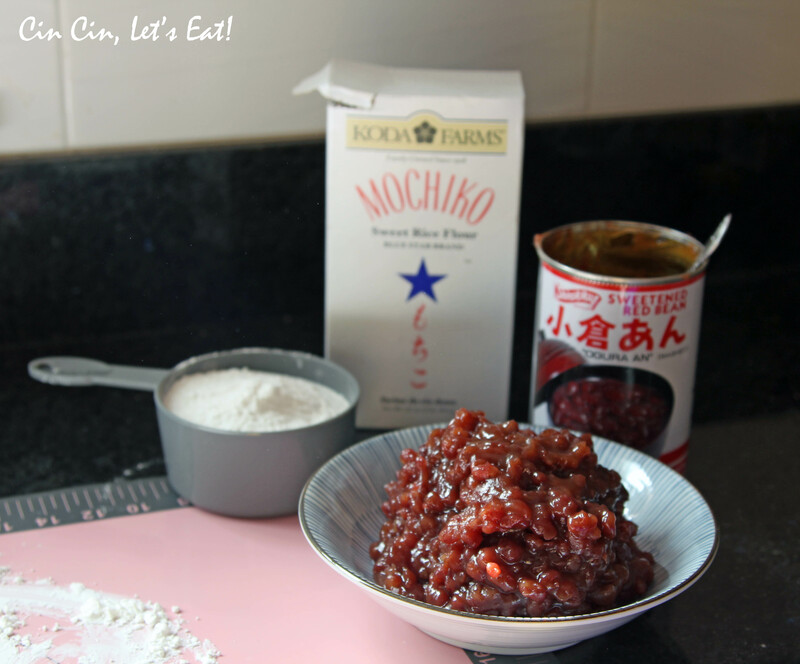 For the pink mochis: Mix the strawberry with red bean paste, then follow the rest of step 5. 6. Dust the white and pink mochis in a mixture that is half cornstarch and half powdered sugar. Dust the Green tea mochis in kinako flour (add a tsp of powdered sugar to the flour for sweetness). I started out with a batch of the white colored mochis. I suspected that either the mixture was too dry or needed to be microwave longer. The resulting mochi was a bit tougher and drier to work with, difficult to pinch the ends together. Here is a picture of the paste prior to microwaving. I made a green tea batch next, added more water and microwave for 2 minutes exactly, turned out pretty good! 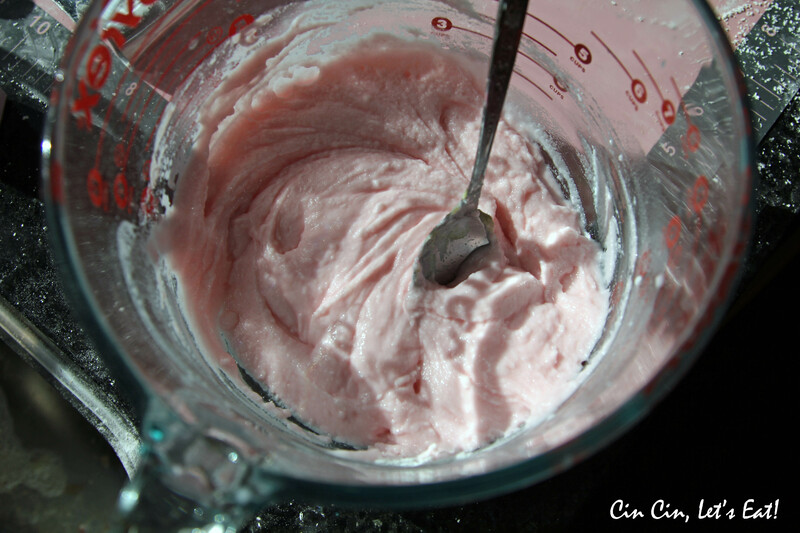 The last batch I made was pink, I have added 2/3 cup of water + 2 Tbsp more. The texture of the paste was significantly better and after 2 minutes in the microwave, the mochi had the best texture and was the easiest batch for me to work with. Although not the prettiest ones around, they were mighty tasty. Not bad for the first time! Next time I will experiment with white bean paste as well as sweetened chestnut. Looks good!! I got a tip before that freezing or refrigerating the red bean paste (out of the can) makes it easier to work with since then the paste is not so liquidy. Have you tried that? Yeah if I have time, I’ll usually do that in advance. These are really pretty for a first time! I’m very excited about this, I might make my own first batch as well. The ones at the store are so hard to find, and I can only find them in ocha flavor, so I want to try making my own! Reblogged this on In air.